Orthodox Christians representing the five canonical Orthodox Jurisdictions of New Zealand gathered at the Dormition of the Theotokos Romanian Orthodox Church known as St. Mary’s in Wellington to participate in the second official Pan-Orthodox Conference on Saturday, September 28th. The theme of the conference was Orthopraxia-Practicing True Faith. The conference was convened under the Omophorion of His Eminence Archbishop Amfilochios of the Sacred Archdiocese of New Zealand, Ecumenical Patriarchate and with the blessings and support of each respective hierarch of the Canonical Orthodox jurisdictions of New Zealand, His Eminence Archbishop Paul of the Antiochian Orthodox Archdiocese, His Eminence Archbishop Hilarion of the Russian Orthodox Church, His Grace Bishop Michael of the Romanian Orthodox Episcopate, and His Grace Bishop Irinej of the Serbian Orthodox Metropolitanate. The day began with the inspiring celebration of the Divine Liturgy in honour of St. Hariton (New Style) and St. Nikitas (Old Style). Three priests led the celebration: Father Nicholas Floroiu the host priest, Father Ljubomir Kudric of the Serbian church of Wellington and Father Stanley of the Antiochian Mission of St. George of Wellington. The responses were chanted by a many voiced choir responding in five different languages. They were ably assisted by guest chanter Mr. Daniel Gradinaru. 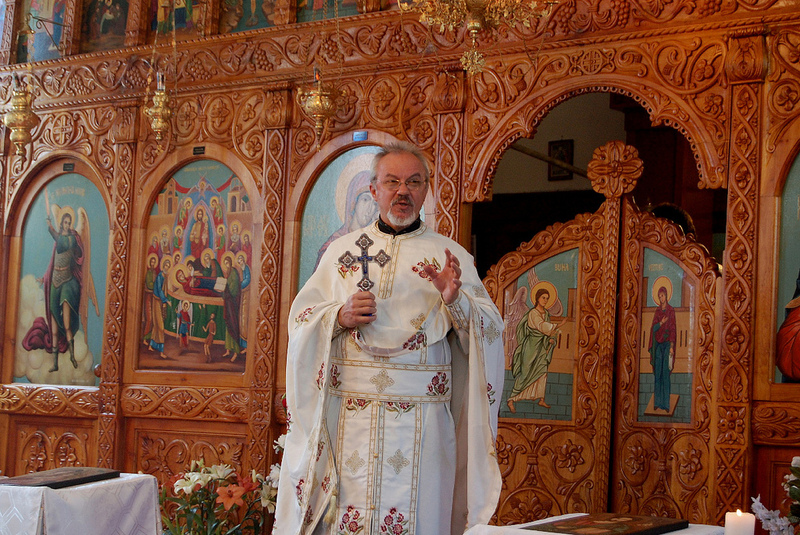 a pious and mellifluous chanter of St. Mary’s Romanian Church, as well as by Archimandrite Fr. Meletios, and Monk Savas of the Holy Archangels Monastery in Levin, Father Alexander Skorik, Fr. Paul and Nicholia Patitsas of Holy Trinity in Auckland. Following a lovely repast we began the day with a brief talk by Fr. Paul Patitsas on the topic of Orthodoxia and Orthopraxia: the two wings of our Ascent to God. Father’s theme was based upon the words of His Eminence Metropolitan Amfilochios to the participants of our last conference in June of this year. The words imply the wonderful dual aspect of our living faith which is grounded in both our love for God and our love for our fellow man. Following his talk the gathered participants broke into four groups to discuss the theme further and to explore ways that we can put our Orthodox faith into actions. Each group then presented highlights of its insights with the rest of the group. Many inspiring and practical ideas came forth from this discussion. Another highlight of the seminar was the wonderful section that was devoted to the personal sharing of some of the participants who each related their own unique story of how they came to vibrant faith and a devotion to the Orthodox faith and traditions. Each story was different but each had a compelling message of God speaking to their hearts and souls, often through the counsel of a pious elder or geronda. The day concluded rather informally with a round table discussion of several topics of interest including the development of an Orthodox magazine for New Zealand called ORTHODOXIA New Zealand, as well as specific thoughts about the dates and locations of upcoming conferences. The next conference has been scheduled for November 16th, at the St. Sava Serbian Orthodox Church in Wellington.